"Nobody likes a fat Elvis impersonator." Bless my soul, what's wrong with me? Everybody's got a little bit of Elvis in them, whether you take the King at face value or with a heavy dose of irony. It's better than a quarter century since his death, and the Elvis industry churns out memorabilia at an alarmingly high rate; the devotion to the King by his legions of faithful has a rabid, quasi-religious quality to it, and if American culture could canonize its heroes, they'd be packing them in the pews at the Church of Saint Elvis. But why this need to re-create the man, as if Elvis's life were a medieval mystery play? That's the subject of this creepily fascinating documentary: the bizarre little subculture of Elvis impersonators, and their quest for glory. The movie is structured around the 1999 Images of Elvis World Championships, which, we're told, is the Super Bowl of Elvis competitions. The film crew follows a handful of Elvii as they make their way to Memphis—our hero and guide is Irv Cass, who has placed third on two previous occasions, and is feeling as if this may be his last shot at Elvis eminence. He surveys the competition and gives us the straight skinny; he's sort of the film's answer to the Stage Manager in Our Town. Hot on his tail are Quentin Flagg, a paperboy from the small town of Argos, Indiana, who, in the throes of puberty, seems more like an Elvis-in-training—bizarrely, his best friend and sidekick is a Buddy Holly impersonator; and Robert Washington, who has previously placed second, has some great moves, and is referred to by his pals as "King." Here's the problem, though: Washington is a black man. Is Memphis ready to crown an African-American Elvis? It's the lives of these guys that are most interesting, and trying to figure out what it is that draws them to the jumpsuits and sideburns. A number of them have had plastic surgery to make them look more like Elvis, and we're told that for almost all of them, growing up, "there was Elvis in the home." They all seem like very nice guys, but the drive to be Elvis is a most peculiar one, and they come from all walks of life: there's Janitor Elvis re-ordering urinal mints, and Mimic Elvis in full Presley regalia doing his best Richard Nixon and Butthead, and unsurprisingly, many, many potbellied Elvii. We also get to see a Belgian Elvis, a Japanese Elvis, a Mexican Elvis (known as El Vez), even Ginger, the female Elvis. And there's the cottage industry around all this, too—the costuming company that makes genuine Elvis jumpsuit reproductions, rhinestones included, yours for only $3,000! No Elvis documentary would be complete without a stop in Vegas, to one of the Elvis chapels and the impresario of one of the Elvis tribute shows; the film crew also pays their respects to the founder of the Elvis Entertainers Network, which will happily supply an impersonator for your private party or corporate event, and promises that you'll be very happy with "the Elvis." Perhaps the strangest people on hand are the "sideburn chasers," the women who lust after Elvis impersonators—nobody cops to it, but it's pretty clear that after the show, there's a whole lot of shakin' goin' on. Wanting to dress up like Elvis and perform karaoke may work for you; sprinting in a Marriott conference room after the sweaty scarf being removed from the neck of a fat guy in an ill-fitting jumpsuit butchering Jailhouse Rock, I do not understand. On hand as well is Vernon Chadwick, the obligatory academic, who uses highfalutin' collegiate language to demonstrate his keen grasp of the obvious: people really like Elvis. Or, "Elvis is the name for something we have in us, or we don't." Will this be on the exam? It's not a spectacular bit of filmmaking, but it is a candid look at a strange little world—it's fun to watch them for a little bit of time here, but you won't be all that sorry once the Elvii have left the building. Image Transfer Review: The film was shot almost entirely with handheld cameras, and the bumping around of the image can sometimes be a little nauseous. You wouldn't expect fantastic cinematography from something like this, and you won't find it, but the transfer to DVD is respectable, with some debris and scratches that were probably present in the original print. Audio Transfer Review: There's a consistent drone of crackle on the soundtrack, which can sometimes get completely distracting, but the dialogue is almost always clear enough. Many of these Elvii are working with cut-rate audio equipment, so their performances frequently feature hideous feedback, which is actually preferable to the violence that some of these guys do to Presley's music. Extras Review: The director and three other members of the crew sit for an enjoyable though poorly recorded commentary track—they don't offer a lot of insight, but they seem like a very nice bunch of guys, and we get to hear them order a pizza, and the buzz of their cell phones. Much attention is lavished on the sideburn chasers, as well as on the appropriate term for the subjects of the film: the Elvii seem to shy away from the word "impersonator," so other options include tribute artist, stylist, and re-creationist. They occasionally went out for beers after a day's shooting with their subjects to a karaoke bar, and you'll never guess what the musical selections there were. Some of the seven deleted scenes include narration that was wisely omitted from the final cut; we also get to meet still more Elvii, including Bowling Alley Janitor Elvis and Environmental Elvis. The outtakes (01m:56s) are just a bunch of Elvis stylists goofing around. Just Pretend: A History of Elvis Impersonators (09m:18s) informs us that there have been Elvis re-creationists for as long as there has been Elvis; unfortunately there are some sync sound problems here, which can make it difficult to watch. What's billed as Media Interviews is actually a single television appearance (07m:50s) on Fox and Friends by John Paget, the director, and Irv Cass, one of the principal on-screen stylists, favoring us with a few bars of Heartbreak Hotel and Hound Dog. This disc also offers the longest trailer (09m:07s) I have ever seen. Bios are provided for six of the Elvii, with more than a few typos, and many great details—for instance, one of them, Doug Church, has issued a tribute album called Kingtinued. Production notes report that one of the crew went native and entered an Elvis competition, with little or no success, and the Mystery Elvis game looks like somebody going a little bonkers with Photoshop, imagining four famous people as Elvis—you're supposed to guess, but I will tell you that it's two Republican Presidents, a teen singer, and a famous film director. 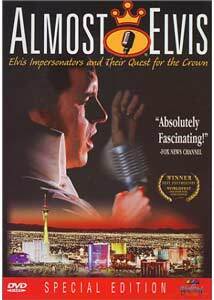 No, Elvis isn't alive and well, bagging groceries in San Antonio, or something, but his spirit speaks to many, many impersonators for all kinds of goofy reasons, and this documentary does a creditable job letting the Elvii speak for themselves. Thank you. Thank you very much.